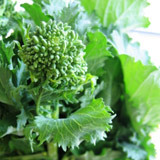 Broccoli Rabe or rapini is a common ingredient in a very diverse range of cuisines. It most popularly used in Italian, Chinese, and Portuguese cooking. Rapini/brocolli rabe is a member of the Brassiceae family and is most likely a descendant of a wild herb, similar to the turnip. The plant has many spiked leaves and a bud that resembles broccoli, which sometimes has small, yellow flowers that are also edible. The taste of rapini/brocolli rabe is often described as nutty and bitter and is full of vitamin A, C, and potassium as well. And not only is this family of vegetables good for your body, it tastes wonderful too and pairs well with strong flavors like garlic, ginger, soy, citrus, and cheese.